McCormick senior Amanda Mirande and Weinberg senior Ailyn Gonzalez in line for early voting at the Lorraine H. Morton Civic Center on Monday. NU professors have encouraged students to vote. 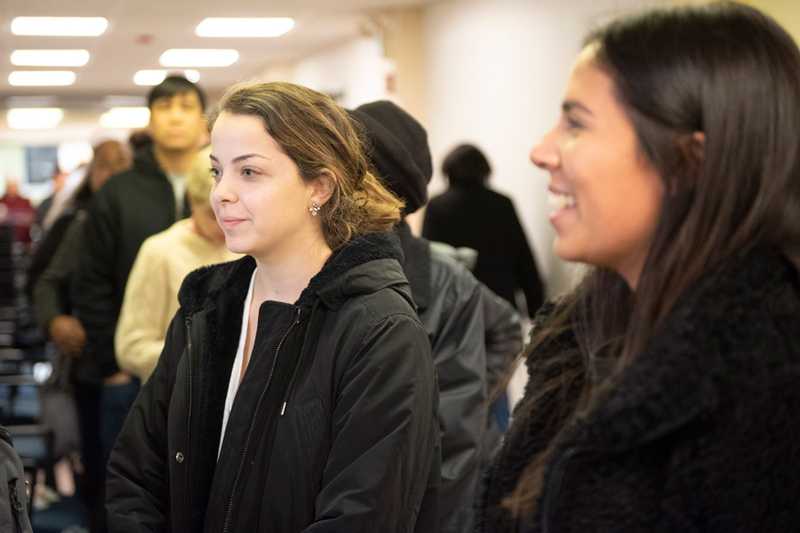 On Monday, Nov. 5, political science Prof. Thomas Ogorzalek cancelled class, allowing students to participate in early voting while also serving as a symbolic gesture of voting’s importance. Ogorzalek is one of 14 Northwestern faculty members and political science professors who have signed “A Day Off for Democracy,” a nationwide letter urging companies, organizations and universities to give all students excused absences and all employees paid leave to vote on Election Day. Ogorzalek, who teaches an American government and politics class, cited low voter participation among young people, a lack of engagement in the midterm elections, registration rules and inflexible schedules on Tuesdays as motivations for signing the letter. NU has been a leader among universities in student voting. 64 percent of eligible graduate and undergraduate students voted in 2016, compared to an average of roughly 50 percent of college students in the U.S., according to the National Study of Learning, Voting, and Engagement. The ALL IN Campus Democracy Challenge recognized Northwestern in October 2017 with five awards, including the highest voting rate among large, private four-year institutions. Illinois has relatively lax voting laws: early voting, no-excuse absentee ballots, long polling hours, no ID requirement, online registration and voting rights extensions to former felons and parolees. Despite these laws making it easier to vote, Ogorzalek said he still decided to cancel class. “That doesn’t mean we shouldn’t also shift the norm to draw more attention to (voting), encourage participation however we can and practice what we preach, since we’re citizens as well as analysts,” Ogorzalek said. Political Science Prof. Mary Golden Dietz, who also signed the letter, said in an email to The Daily that if she had been teaching a class this quarter, she would excuse absences on Election Day. She said she would do “all that (she) could” to give students the opportunity to get to the polls. Dietz said she supports making Election Day a national holiday, but it would not necessarily guarantee people would be able to exercise their right to vote. She pointed to a North Dakota law, upheld by the state’s Supreme Court, that requires voters to have an address — which has disenfranchised many Native Americans and people with housing insecurity. Similarly, Georgia’s “exact match” law mandates that people’s government-issued IDs perfectly replicate the information on their voter rolls. This law could have prevented up to 3,000 eligible Georgians from voting, but a U.S. District judge ruled against it. “Instead of maximizing opportunities for voter registration and casting ballots, (state governments) are busily finding all sorts of injuriously anti-democratic ways to minimize and in some cases wholly eliminate practices designed for representative democracy to work,” Dietz wrote in the email. She said she considers these laws as part of a trend during the “Trump regime” to disenfranchise black, Hispanic and Native American communities. SESP sophomore Jacob Jordan, who is in Ogorzalek’s class, voted by mail, but he said the class cancellation was symbolic, not just an attempt to help students vote.